Downloading and getting to know the MusicZen portable files. When you donate and complete the checkout process you will receive an e-mail with your license key and a link to download the executable file. At present, the file name is ‘MusicZen_v1.4_portable.exe’ which reflects the current version of the app. For the free download, the file name will be ‘MusicZen_v1.4_setup.exe’. Once you click on the link from your e-mail receipt the file will start downloading. Once the download finishes, depending on your browser, you may need to open the ‘Downloads’ folder, or just click on the message given by the browser confirming the download has completed. I would recommend opening the download folder and moving the file (MusicZen_v1.4_portable.exe) to a folder where you will want to keep it for the long term. I end up cleaning out my ‘Downloads’ folder quite regularly so I would not want to make this folder its home. I suggest on the root of the c:\ drive or on your desktop. But it really can be moved where ever you desire. I have moved it to the desktop for this example. Once you move MusicZen_v1.4_setup.exe to the desired location, go ahead and double click on it to run it. The file will extract all the needed files to run MusicZen on the local machine. Once this file extracts its content, it will self destruct. 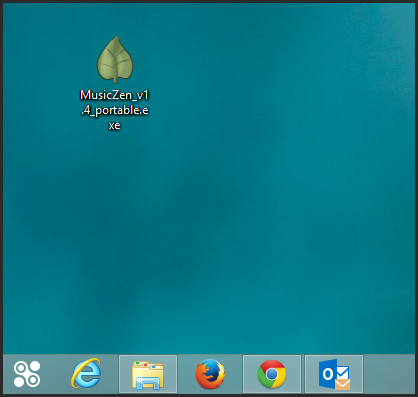 So you will notice that the MusicZen_v1.4_portable.exe will be gone. 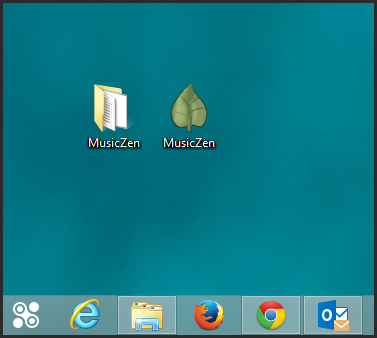 You will now see a folder called ‘MusicZen’ and also a MusicZen shortcut on your desktop. 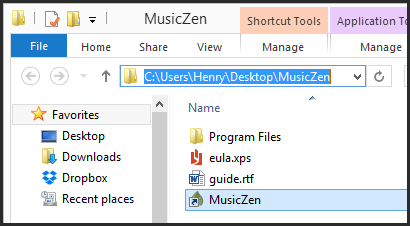 This shortcut points to the executable in the ‘MusicZen/Program Files’ folder. The ‘MusicZen’ folder will contain 3 files and 1 directory. One of the files is the End User Agreement (eula.xps). The second is the User Guide (guide.rtf). 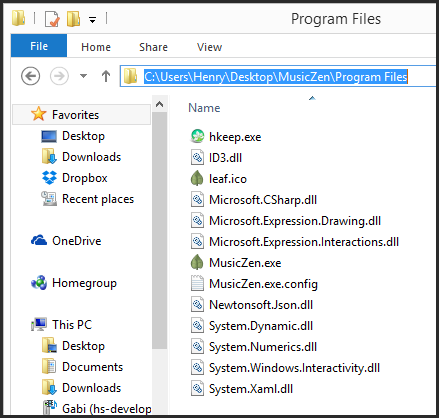 The third is a shortcut to the executable file (MusicZen.exe) which starts the program. The directory is the ‘Program Files’ folder which will have all the core files needed for the application to run. These files must be kept together or the application will fail to launch. If you ever want to take MusicZen with you to run it from a USB drive (or any other detachable media), or to transfer it to another computer, all you will need to do is copy the entire ‘MusicZen’ folder to the desired drive and thats it! It is that simple. You can then launch it by clicking on the MusicZen shortcut in the MusicZen folder. The program will run on any Windows XP, 7, 8 machine with the .NET framework installed (which is all Windows machines nowadays). I hope this has helped in getting you more acquainted with MusicZen, downloading and getting to know the MusicZen portable files. Thank you for reading and supporting MusicZen. Enjoy your day/evening wherever you are!